«You»: Wolfwing!! If it's a fight you want, it's a fight you'll get! «You»: Shut up and fight! Artix: Why have you come here? What dark plans do you have now?! Dewlok: He has come because I have asked him to. He came to Granemor first, expecting a better reception there - as we indeed do tend to be less judgemental. Artix: I have no quarrel with you, Dewlok - but why would you advise Wolfwing to come HERE of all places? Dewlok: Because it is here that the resistance to The`Galin is assembled, and his reason for coming concerns the Devourer. Or more specifically his agents. Dewlok: Wolfwing has in fact already helped once in that effort. Cenara: It concerns my father - and that spider he now accepts orders from. «You»: I am confused. I thought your father was a farmer your mother met after leaving Balius! Cenara: I never said that the farmer was my father. Only that my mother married him after leaving my father. Wolfwing: Nightbane has fallen completely under the geas of Epheel. Epheel lies, cheats, steals and manipulates to get his way. Dewlok: The ancient Moglin texts refer to a deceiver who comes as a harbinger for the Devourer. That is the role Epheel plays and he has done it well. Artix: What does this have to do with coming here? Cenara: My father has gone mad. He tried to kill Wolfwing again and then he turned himself upon me. I am sure that I can speak reason to him. If only I can get close enough. Wolfwing: We have come to ask for your town's help, Paladin. Artix: I never would have thought such a day would come. One of my most fierce enemies asking for my help! Wolfwing: Nightbane has been charged by the Void. He is a dangerous creature and he is a threat to all of us. Dewlok: Think what would happen if he attacked now. Think hard about it. We are building our defenses against one army already-- the Devourer's Network. Dewlok: We cannot afford to fight on a second front. Cenara: My father has fallen to the darkness, but he was once a good man. I am certain that something better can be made of this situation. Please. Will you gather help for me? Artix: Well, «You», what say you? Will you help Cenara speak reason to her father Nightbane? «You»: This sounds dangerous to me, but count me in! We need to stand together if we are to survive the Devourer's plans. The world-eating Devourer has returned to Lore, and is using Agents of many types to manipulate the various peoples of the planet into conflict. The Devourer's army of creatures from all over the universe, known as the Network, has been gaining power. 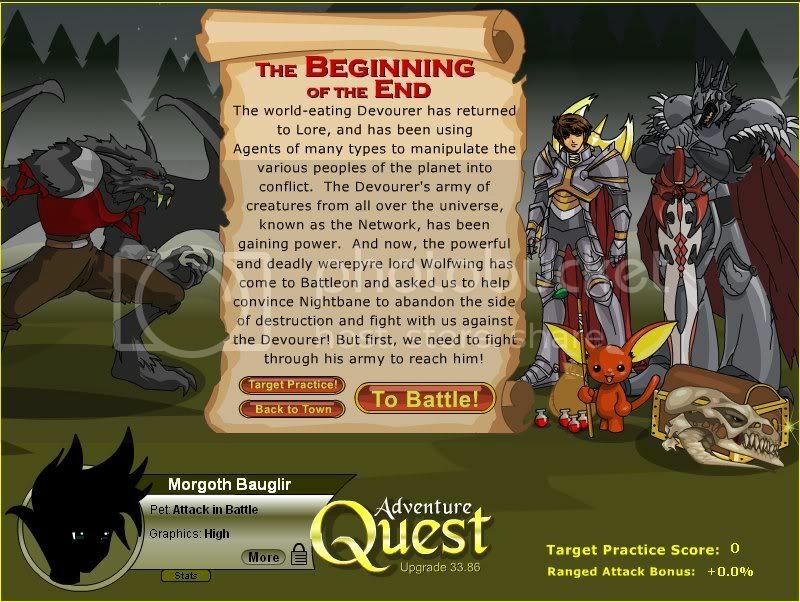 And now, the powerful and deadly werepyre lord Wolfwing has come to Battleon and asked us to help convince Nightbane to abandon the side of destruction and fight with us against the Devourer! But first, we need to fight through his army to reach him. Twilly: Good luck fighting all those monsters to find Nightbane!! Twillies will do what he can do to help! Shooting undead in the background provided a +.1% BTH bonus per undead hit (to a maximum of +20% BTH). Legendary paladin Artix Krieger has come to join us in battle! Wolfwing is a Werepyre, part vampire and part werewolf. He is also the father of Nightbane! Galanoth the Dragonslayer thought it wise to help because the dracopyre Nightbane is part dragon! The Chest: You open the treasure chest and find Dracolich Rider Armor! As a temp weapon you can bring the Adventurer Darklaw or Guardian Darklaw. Nightbane: Ah, you have returned so I may put an end to you. You will strengthen me and strengthen the Master's armies. «You»: Since when have you answered to a master, Nightbane? Have you been brainwashed? Nightbane: I have been given power you cannot begin to imagine. Cenara: Enough! No one must die here today! Father-- please listen! Nightbane: Cenara! What are you doing here?! Cenara: Epheel has used you. You once were proud and noble. Even when you fell entirely into your darkness and greed you maintained that pride and nobility. Epheel: Do not listen to her. Kill her! Cenara: Now, however? What has become of you? Have you completely given in to madness? Have you completely given up your honor and pride? Cenara: The Devourer The`Galin will destroy you, Father. Just as he will destroy all he serve him from dark motive. Cenara: Please. Reconsider what you have done. Please. I am begging you. Come back to us. Epheel: Death. We must have death! «You»: Don't listen to that mutated excuse for a wizard! All he does is trick people. And he stinks like rotten eggs, too. Agent Smith: Oooh! Now THAT'S hitting below the belt, baby! Yeah! You: Stand back, Cenara-- I'll protect you!! Agent Smith: Nightbane, baby.... Who's on your side? Nightbane: You should really have taken a lesson from my father. I have a habit of outstripping my masters. «You»: What was that?! He melted?? Nightbane: He belongs to the Devourer and in death his soul is taken. Nightbane: I know nothing about what you will do. However my daughter has begged me to stop The'Galin. I plan on seeing him dead. Nightbane: But know this. That the man I was, if he exists-- still loves you dearly. Thanks to ZZlzhtT. Monster lists from Reyn Roadstorm. Typo correction from mickey 209.